Will Coca-Cola Raise Its Dividend in 2019? The drink maker made a lot of progress with its corporate moves in 2018, and shareholders want their just rewards. It's hard to find a dividend stock that can match the history that beverage giant Coca-Cola (NYSE:KO) has had. For decades, the stock has generated impressive double-digit percentage returns for its shareholders, and Coca-Cola has managed to do well even during tough times for the rest of the economy. 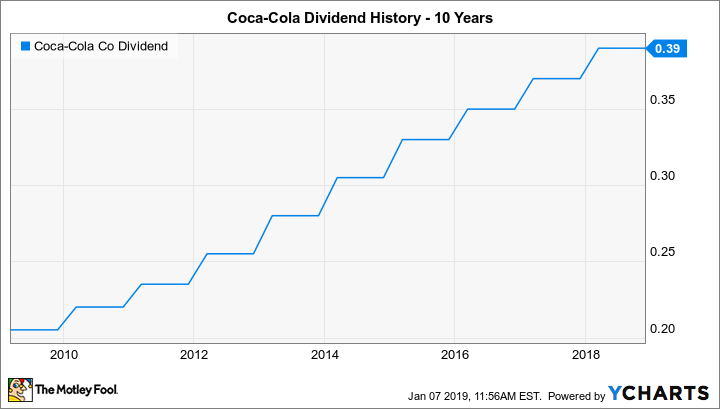 Dividend investors have also seen big rewards from holding Coca-Cola stock, with more than a half-century of consistent, reliable dividend growth. As the company once again makes some major moves toward a more capital-efficient strategic vision, shareholders want to know if they can expect continued dividend growth from Coca-Cola. With that in mind, we'll look more closely at the company to see whether it's likely to keep moving its dividend higher in 2019. Source: Yahoo! Finance. Last increase refers to ex-dividend date. Investors have enjoyed steady and impressive growth not just in Coca-Cola's share price but also in its dividend payout. The beverage giant has made a habit of making modest single-digit percentage increases that nevertheless add up to significant dividend growth over time. For instance, in 2008, Coca-Cola paid slightly less on a per-share basis in dividends than it did in late 2018 -- but since then, the stock has gone through a 2-for-1 stock split. That means effective payouts have more than doubled. Dividend investors have seen growth slow down to some extent, though. The 2018 increase of $0.02 per share set the new payout at $0.39 per share, and that 5.4% increase was quite a bit less than the 8% to 9% increases that it often made early in the 2010s. As we've seen in past years, though, Coca-Cola's dividend raises questions of sustainability right now. A payout ratio above 200% usually indicates problems that could threaten a dividend cut in the future, but much of the reason why the beverage company has seen earnings drop has to do with the corporate restructuring moves it's made lately. In particular, the effort to refranchise Coca-Cola's bottling operations stands to make its capital asset structure look much simpler in the future -- but it comes with short-term pain in the form of extraordinary charges that keep earnings down and make payout ratios look artificially high. From a fundamental standpoint, Coca-Cola is working hard to look better financially. Revenue has taken a hit because of its bottler refranchising, but margin improvement has been significant, and that stands to continue into 2019. More importantly, Coca-Cola has made successful efforts to diversify its drink lineup, and so far, customers appear to be responding favorably. Rather than sitting idly by as consumer appetites for sugary soft drinks wane, Coca-Cola now has moved more aggressively to offer tea, coffee, juice, and energy drinks. Those efforts have paid off with greater business resiliency, and even if profit margin might suffer because costs of some of those beverages are higher than producing namesake Coke syrup, it's a necessary step to stay in touch with the company's customers. There aren't any new challenges for Coca-Cola to face in the coming year, and its strategy to address the older legacy problems appears to be working out well. With that in mind, it's likely that Coca-Cola will deliver another modest dividend increase of $0.02 to $0.03 per share during 2019, extending its dividend growth streak and keeping shareholders happy. Add the prospects for share-price growth once its strategic vision takes more concrete shape, and Coca-Cola could be a smart investment in the coming year.